Get a bird's eye view of Manhattan, Ellis Island, Brooklyn and more when you take a New York City helicopter tour. Get a unique view of some of the most famous NYC landmarks like the Statue of Liberty, Brooklyn Bridge, or the Empire State Building. 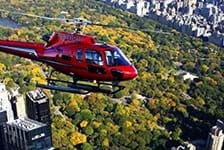 NYC helicopter tours will add fun and excitement to your next trip.